Barely a month old, The Blackboard Bakery will welcome you with its charming and pretty space. You will stay back for their breakfast, small bites, and cosy cafe vibes. It's the charming cafe space dotted with greens, pretty corners, and cosy vibes that will draw you in. The outdoor spot works for us and for those of you who are coming for a quick bite or meeting someone. Daytime, the outdoor space feels like you are sitting under a large canopy with foliage hanging from the ceiling. Larger groups can pick the table by the wall of greens or inside, by the dessert counter. 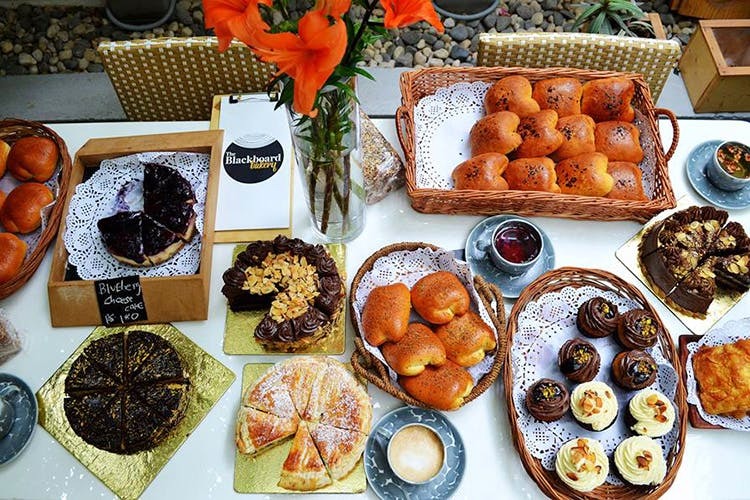 Happily drool at the cheesecakes, stuffed buns, and brownies while you wait for your order. Breakfast, small bites, lunch salads, and cafe staples of burgers and sandwiches form the menu. But don't worry, it's not regular cafe fare, they do make things interesting with the cheeky names for the dishes and adventurous flavours. Really adventurous. Think peanut butter and jelly wings and basil pesto churros. Yup. The Search Is Over and Little Wing are two burgers we are planning on trying the next time. One comes with a coffee-marinated beef and sausage patty, while the other has buttermilk fried chicken patty. Have a shake if you don't feel like munching on anything. Our recommendation is the No Witnesses, a cheeky name for a chocolate overloaded shake. The coffee menu is limited to just four options, but if you are okay switching sides, there are some pretty interesting tea options. Think Kashmiri Khawa and Turkish Apple. Also, the PB&J wings are recommended, but just we really don't recommend it. It's also called Hahaha. They have started breakfast boards and anyone looking for a big breakfast to start their day, you know where to go.